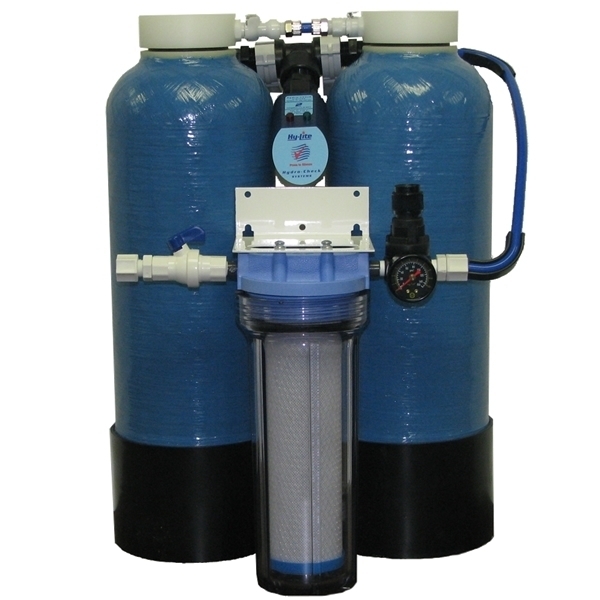 The system has a flow rate of 5-Liters/minute and includes three DI tanks (two installed plus one spare), an activated carbon prefilter assembly with pressure regulator and gauge, and a 2-Megohm-cm purity monitor. The monitor has a Green LED to indicate that the system is producing >2 megohm-cm Type II water. When the water quality drops below 2 megohm-cm a Red LED flashes to alert the user that it is time to replace the DI module. This model is also available for high flow, high capacity applications such as glassware washing: Model 2618S2-DW. AQUA SOLUTIONS' Type II DI lab water purification systems are designed from the ground up to be user-install-able and user-serviceable! This system is designed for use on tap water containing up to 170 PPM of total dissolved solids and is for applications that require up to 80 Liters of Type II DI water/day. Ion Exchange Capacity of 6,000 Grains. Purification DI Modules The system includes one installed plus one spare. No installation charges You purchase and own the system hardware at a reasonable cost. No service charges The system is so easy to install, you can do it yourself.